Recently Changed Controls the visibility of the icons and gizmos for components and scripts that you modified recently. This section appears the first time you change one or more items, and updates after subsequent changes. For more information, see Built-in components, scripts, and recently changed items, below. Scripts Controls the visibility of the icons and gizmos for scripts in the Scene. This section appears only when your Scene uses scripts that meet specific criteria. See Built-in components, scripts, and recently changed items, below, for further information. Built-in Components Controls the visibility of the icons and gizmos for all component types that have an icon or gizmo. A. The Recently Changed section controls the visibility of the icons and gizmos for items that you’ve modified recently. It appears the first time you change one or more items. Unity updates the list after subsequent changes. Have an icon assigned to them (see documentation on Assigning icons). This section appears when your Scene contains one or more scripts that meet the above criteria. C. The Built-in Components section controls the visibility of the icons and gizmos for all component types that have an icon or gizmo. 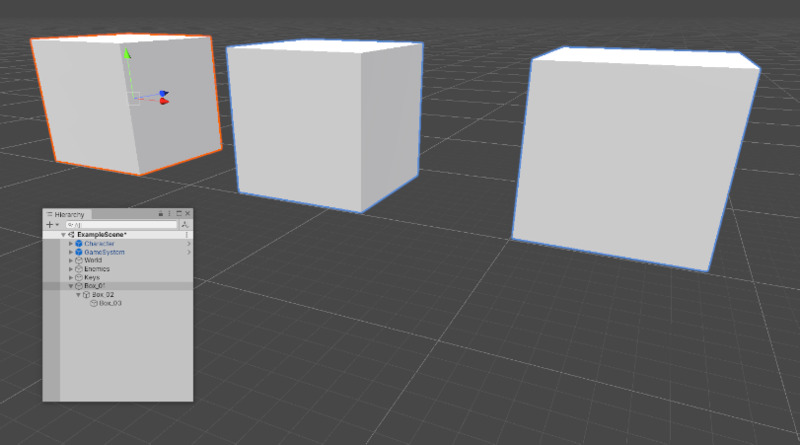 Built-in component types that do not have an icon or gizmo shown in the Scene view (for example, Rigidbody) are not listed here. The icon column shows or hides the icons for each component type. Full-color icons are displayed in the main Scene view window, faded icons are not. 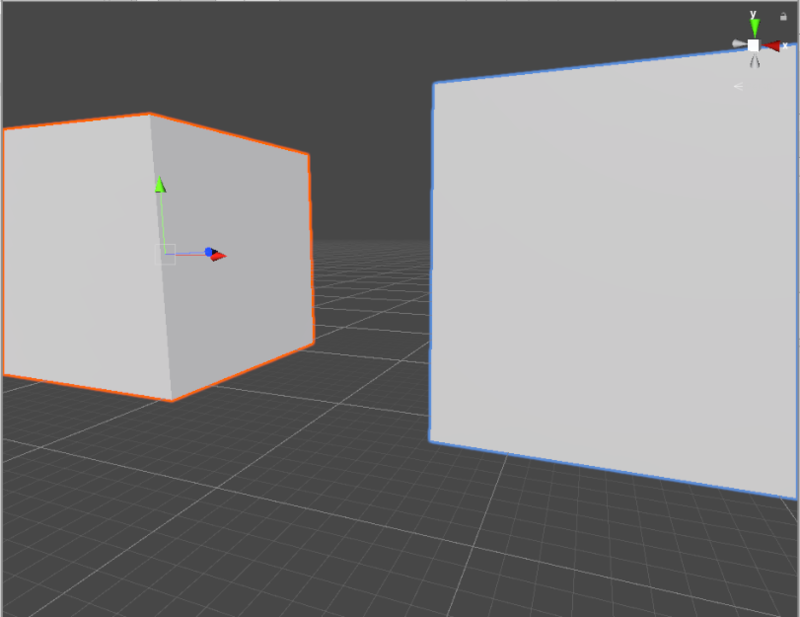 The Light icon is faded, indicating that the Editor does not display light icons in the Scene view. The Camera icon is full-color, indicating that the Editor does display camera icons in the Scene view. To toggle an icon’s visibility in the Scene view, click any icon in the icon column. Note: If an item in the list has a gizmo but no icon, the icon column for that item is empty. Scripts with custom icons show a small drop-down menu arrow in the icon column. To change a custom icon, click the arrow to open the Select Icon menu. 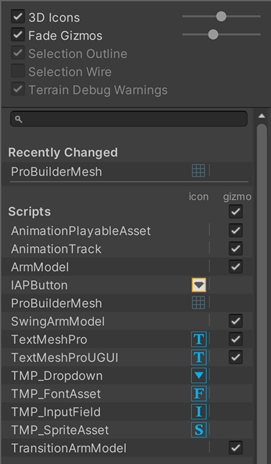 To control whether the Editor draws gizmo graphics for a particular component type (for example, a Collider’s wireframe gizmo or a Camera’s view frustum gizmo) or script, use the checkboxes in the Gizmo column. When a checkbox is checked, the Editor draws gizmos for that component type. When a checkbox is cleared, the Editor does not draw gizmos for that component type. Note: If an item in the list has an icon but no gizmo, the Gizmo column for that item is empty. To toggle gizmo visibility for an entire section (all Built-in Components, all Scripts, and so on), use the checkboxes next to the section names. 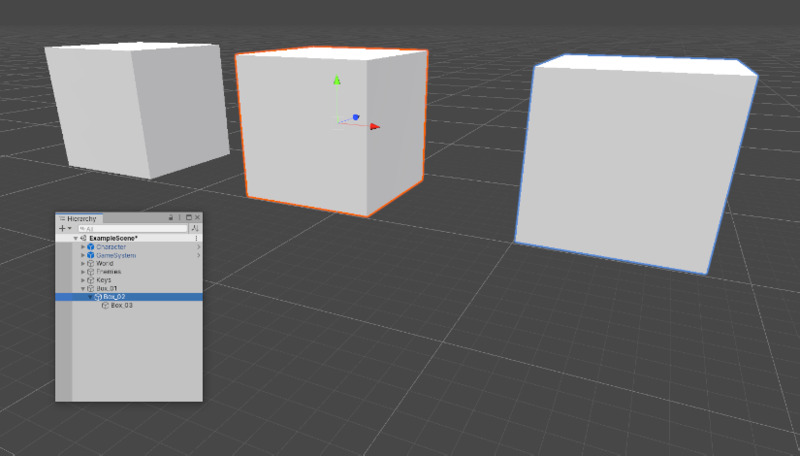 When the checkbox displays a square, gizmo visibility is toggled on for some item types in the section, and off for others.